The majority of ETFs on the market today track market capitalization-weighted indexes. These ETFs pick and weight stocks according to the whims of the overall market. As the investors that drive the market are prone to bias, so too are the ETFs tracking it. As we are now able to recognize the fallibility of investor’s decision-making, the next step is to figure out how to get on the other side of the trade. Studies conducted in academia and investment houses have been providing insights on how to solve for behavioural bias for years now – via smart beta factor-based investing. In this post, I will review examples of cognitive and emotional bias in finance and the ways in which factor investing can address them. Overconfidence is when investors distort the value of their own judgment about future events, and unreasonably discount information to the contrary. Related, confirmation bias, pushes investors to seek out data that reinforces an already held belief, while ignoring contradictory information. Recency bias is the tendency to place more weight on recent information, not taking long-term history sufficiently into account. Preference for lotteries is the willingness to take on a certain amount of risk if there is a chance of a large win, even when the likelihood of winning is slim-to-none. Loss aversion is the tendency to place greater importance on a loss than on a gain of the same magnitude, which can lead to irrationally avoid stocks or regions with negative headlines in the news. Herd mentality is the tendency for individuals to mimic the actions of a larger group, regardless of the rationality of the behaviour. This can be particularly dangerous when market mania strikes (tech bubble) or when panic sets in (financial crisis). Can factor investing help overcome these biases? Can factor investing overcome recognized behavioural biases? Let’s look at two specific factors that are currently available to ETF investors in the marketplace, how they function and how they can help solve for ingrained investor tendencies. The expected value of buying a lottery ticket is negative. Therefore, no rational person would ever buy a lottery ticket. The logical conclusion then is that operating a lottery anywhere in the world would be futile. However, as we know, billions of dollars is spent on lottery tickets every year…behavioural economists believe that some people are willing to risk a known amount in exchange for the possibility, even a very slim possibility, of a huge financial windfall. Craig sums it up nicely, and explains why people buy over $200 billion in lottery tickets each year. This same behaviour can occur with what we call “story stocks” – those that have some kind of hype around them that draws in speculators. Low-volatility strategies aim to do just the opposite – build wealth in a steady way, without the drama, by avoiding the stocks that are attracting “hot money flows” and focusing on those with less volatility. By avoiding these “story stocks” that feed into both the overconfidence bias and the natural desire to “win big”, low-volatility strategies focus on the smoother ride. Ultimately, better valuations and reduced volatility drag can lead to outperformance. Low-volatility investing aims to avoid sectors experiencing significant drawdowns. It won’t happen all at once, but the quarterly screening process can allow it to avoid the worst of sector-driven bear markets. 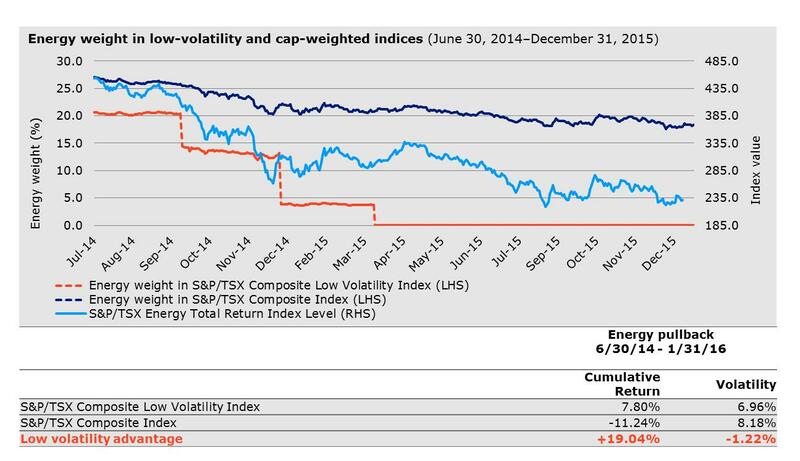 For example, the chart below shows how the S&P/TSX Composite Low Volatility Index outperformed as volatile energy stocks were shifted out of the index between early summer 2014 and year-end 2015. Source: Bloomberg L.P., as at December 31, 2015. This chart was selected for illustrative purposes only and is not intended to convey specific investment advice. Over time dividend-paying stocks tend to outperform those that don’t pay dividends – while facing less volatility. 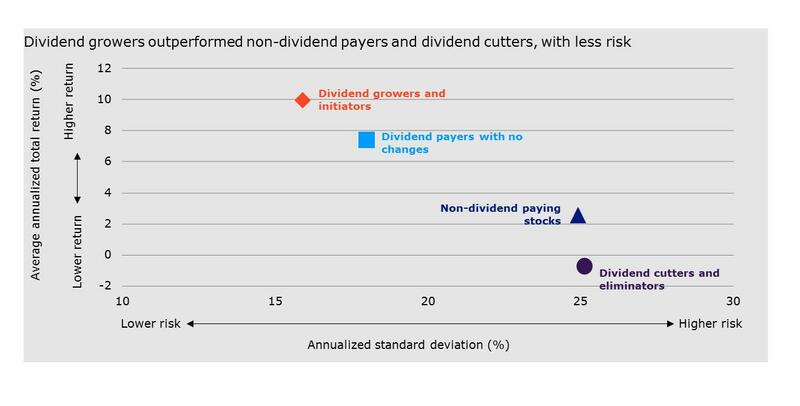 It is also true that companies with a history of growing their dividends over time tend to outperform both those that maintain a steady dividend, non-payers, and particularly those that cut or eliminate. This chart highlights the risk-return differential over the past 40 years. Source: Ned Davis Research, Inc., from January 31, 1972 to December 31, 2015. This chart illustrates the average annualized historical performance of S&P 500 Index stocks, grouped as shown according to their dividend policies. The returns do not reflect the deduction of any fees, expenses or taxes. Returns for stocks that paid dividends assume reinvestment of all income. You cannot invest directly in an index. Past performance is no guarantee of future results. Smart beta factor investing allows investors to focus on companies that pay and grow their dividends. From a behavioural perspective, this helps address recency, herding and loss-aversion. Let’s take a closer look. Recency bias: Investors may overreact to the latest news headlines, and stocks can be mispriced because of the amplification of the news, whether negative or positive. By focusing on companies with a long history of dividend growth, investors can avoid being distracted by short-term noise and excessive focus on reported earnings. Herding: By focusing on historical growth of dividends, investors can help avoid the natural desire to follow the crowd that has picked a “winner” or a “loser” with a certainty that may be misplaced. Loss-aversion: As with herding, a factor strategy with a rules-based approach helps investors stay the course and avoid the tendency to make decisions based on fear. Now that we have established the ways in which these two factors can help mitigate the risks associated with investor bias, let’s look at the potential benefits of combining them. Combining the low-volatility and dividend factors is one way to help solve for this issue. 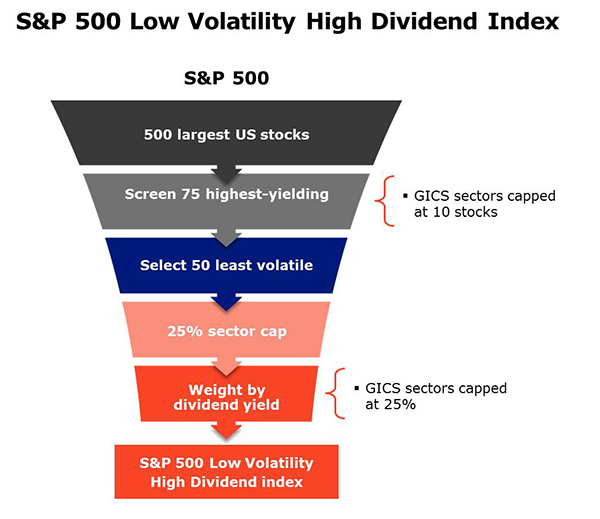 The chart below shows how the S&P 500 Low Volatility High Dividend Index is constructed. Source: Invesco Canada and S&P Dow Jones Indices.This chart was selected for illustrative purposes only and is not intended to convey specific investment advice.You cannot invest directly in an index. As with other fields of research, understanding and accounting for behavioural biases allows us to avoid some of these critical reasoning errors – and in some cases, even aim to take advantage of them. It’s important to note that factors tend to perform in cycles aligned with the business cycle and a diversified approach is best determined between an investor and their financial advisor. If you have any questions, please feel free to leave a comment below and I am happy to answer. For more information, contact your Invesco sales rep or visit www.powershares.ca. 1 A dividend or yield “trap” refers to a company that offers an unsustainably high dividend yield. Such a company may face fundamental or financial challenges that may cause its management to cut or terminate dividend payments in the future. 2 Source: S&P Dow Jones Indices & Bloomberg L.P., from July 31, 2015 to January 31, 2016.